When you hear the word “bruise”, you likely picture a black eye or a black, blue, or purple mark on the skin. Bruised ribs may be an uncommon injury to sustain, but when it happens, it can be very painful. These are bruises of the skin, but they are not the only type. Your bones can also become bruised, a condition which is considered to be a step below a fracture in terms of severity, but this does not make them any less painful or disruptive. Your bones are not as solid as the pictures would have you believe. The inside of your bone contains a softer, spongy section of connective fibers called trabeculae. Trabeculae help provide structure, retain calcium, and other functions related to the bone’s integrity. When some of the trabeculae are damaged, the result is a bone bruise as the broken trabeculae bleed and swell. This is different from a fracture, which is when all of the trabeculae in a section have broken. Subperiosteal hematoma: This is when the injury and bleeding occurs just beneath the outermost layer of the bone, called the periosteum. This type of bone bruise is most common in the lower limbs or ribs. Interosseous bruise: This is when the injury and bleeding is found in the inner portion of the bone, in the same area as the bone marrow. These are most common in the ankles, knees and feet. Subchondral bruise: The ends of your bones are tipped with cartilage that helps connect one bone to the next. In a subchondral bruise, the cartilage has detached from the bone and there is bleeding in between the two. A bone bruise is most often the result of an injury. Almost any blow strong enough to damage the bone but not fracture it can cause a bone bruise, but some forms of injury are more likely to result in a bruise than others. Direct force trauma: Any direct blow to the bone can cause a subperiosteal hematoma (i.e. a car accident, sports tackle, falling down the stairs, or dropping something heavy on the foot). Repetitive pressure: Subjecting the bone to regular high compressive forces is the most likely way to get an interosseous bruise. This is seen a lot in football players, basketball players and runners. Extreme compressive force: In cases where the bone is subject to a sudden, extreme form of compression, the cartilage can literally be crushed enough to separate and create a subchondral bruise. The impact from running on a hard surface or a blow to the sole of the foot can cause this type of injury, as can any high-velocity impact, such as a fall or a car accident. Twisting: Sudden twists, like those in a sprained ankle or knee, can cause a bone bruise. The shearing from such a twist is more likely to produce a subchondral bruise than other types since it can strip away cartilage. Medical conditions: Conditions like arthritis wear away at the protective cartilage between bones and causes them to grind against each other. This can create a subperiosteal hematoma or subchondral bruising. The symptoms of a bone bruise are similar to those of a regular bruise. Namely, you can expect to experience pain and tenderness in the affected area, swelling in the surrounding tissue, and a change in color. If a bone bruise happens in or near a joint, blood and other fluids can spill into the joint, causing swelling and stiffness. While bone bruises will vary in severity, on average they last longer and hurt more than a normal bruise. Diagnosing a bone bruise requires consulting your doctor. If a bone injury is suspected, an X-ray is usually called for. While bone bruises don’t appear on X-rays, fractures do and the test is important for ruling out more serious damage. Depending on the size and severity of the bone bruise, it can take several weeks to around four months for one to heal properly. During this time, your primary goals are to help minimize the inflammation and swelling while avoiding activities that can further aggravate the injury. Rest: You will need to give the affected bone plenty of rest and avoid placing stress on it. This will be easier or harder depending on where the bruise is located. You may, for instance, need a knee brace to keep pressure off a bruised knee while a bruised rib may just require you to not lift anything heavy. Splits, elastic bandages, athletic tape, crutches, and slings may also be employed at your doctor’s advisement. Elevation: Elevating the bruised bone so that it is above your head will help reduce swelling. Hot and cold therapy: Wrap an ice pack or plain ice in a thin cloth and apply to the bruised site. This will help ease swelling and pain. Cold therapy will work best if performed for 10-15 minutes every three to four hours. Once the swelling has gone down (usually after three days or so), you can switch to heat packs and hot water bottles. Medication: Painkillers may be prescribed by your doctor or obtained over-the-counter as needed. As with any medication, always follow the dosage directions on the bottle, including whether or not you should take the medicine with food. Avoid smoking: Tobacco and nicotine delay and interfere with the healing process because they constrict blood vessels. This also increases the possibility of a complication when experiencing larger bruises. Diet changes: Calcium, vitamin D, and protein all promote bone growth and repair. Making sure to keep high levels of all three in your diet (and getting sunlight) will help move the healing process along. Physical therapy: Physical therapy will not speed up recovery per se, but a physical therapist can teach you how to avoid stressing the bruised bone and how to go about your daily activities with minimal discomfort. Aggravation: If the bone is subject to repeat injury or stress while the bruise is healing, the recovery process will become delayed. 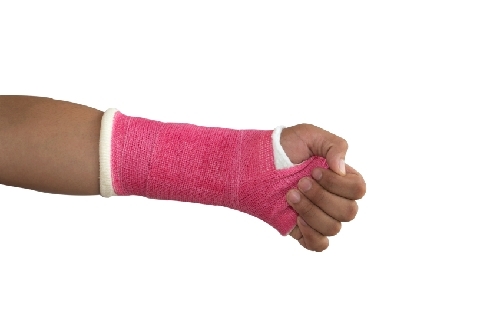 In some cases the repeat trauma can turn a bone bruise into a fracture or break. Avascular necrosis: In cases of very large bruises there may be trouble restoring the blood flow to the site; this can lead to necrosis and death of that part of the bone. Clots: Sometimes blood can build up in the bruised location and create a clot. This will result in increased pain, redness, swelling, and the skin will feel warm or hot to the touch. If this happens you need to seek medical attention immediately. A bone bruise does not automatically necessitate a doctor’s visit, but you should ideally get seen to rule out the possibility of a fracture. You should also see your doctor if you experience a fever, the swelling increases, you don’t see any improvement after a few days of icing and rest, or the skin is pale and cool to the touch around the injury. “Bone Bruise,” MD-Health web site, http://www.md-health.com/Bone-Bruise.html, last accessed November 30, 2015. “Bone Bruise,” Saint Luke’s Health System web site, http://www.saintlukeshealthsystem.org/health-library/bone-bruise, last accessed November 30, 2015. Brock, S., “What You Need to Know About a Bone Bruise,” Livestrong.com, October 21, 2015; http://www.livestrong.com/article/5521-need-bone-bruise/.